Eddie Barnhill is a third generation fisherman, who wasn't able to make a living off the water. Barnhill used his same space to open up an ice making shop. SAINT JAMES CITY, Fla. -- One door closes another opens for one business on Pine Island. The impacts from red tide left a third generation wholesale fisherman with a tough choice, close up shop and move or try something new. “By no means am I giving up on fishing that’s my heart and soul, but we have to have an income,” said Eddie Barnhill JR, Owner, Got Ice. Barnhill says he use to bring in around 60,000 pounds of stone crabs to just 800 in just one year. 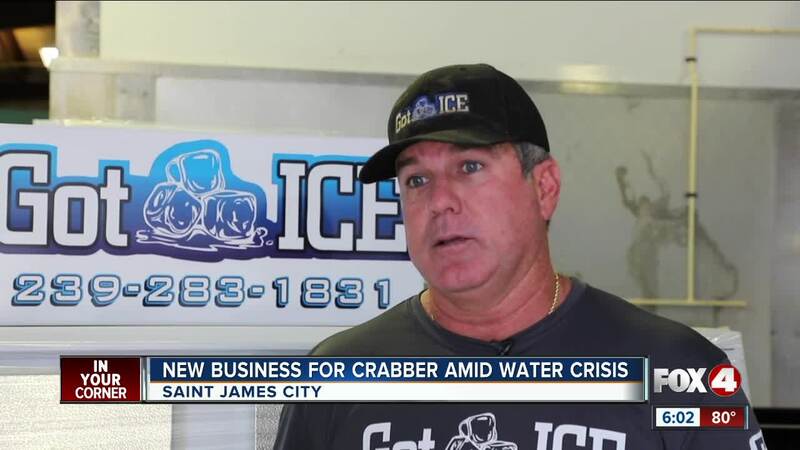 “It’s pretty much wiped out the stone crabs for this area, so we just had to convert and we decided to go into the ice business," said Barnhill. Got Ice launched in January and Barnhill was able to use his space for the new business. It provides a 24-7 ice delivery service for restaurants, marinas, and special events across Southwest Florida. Barnhill says customer service is his top priority. “For anyone if their ice machine goes down, you give us a call, 24-7, any time of day, and we’ll bring you ice,” said Barnhill. Even though he has a new business, he hasn't stopped going out on the water. “Three generations of my family has grown up on water and seafood industry we really need to fight and help do what we can to get this water issue cleaned up,” said Barnhill. The community of Pine Island is doing it's part to help. “The red tide didn’t just hurt the fisherman, it hurt me as wholesaler, it hurt the retailer, consumer at the end because prices have gone sky high,” said Barnhill. The owner of Island Seafood Market founded Florida Commercial Watermen's Conservation in hopes to find a solution to the water crisis in their backyard. "We partnered with NOAA to do offshore testing, we are going to be testing for temperature, salinity, dissolved oxygens,” said Casey Streeter, Founder, Florida Commercial Watermen’s Conservation.